So anyone can tell me what the heck this is . Btw , my initial interest was to make this brushless since I have a spare Mamba XL sitting around and would just need a motor and conversion kit so I thought at first . More pics at different angles and close ups of different areas would be helpful. V sweet deal - bargain. The radio alone is worth $125. Looking at your pics I would say $125 is a great deal. That thing looks to have been worth about a grand RTR. Not sure of exactly what it is, but it looks like a 1/5th scale. Even if you do have to spend a couple hundred bucks to make it race worthy your getting a good deal. I would do it. Can anyone positively identify it as an FG? There are some really cheap knockoff 1/5 scale cars. If it's anything other than an FG it's a money pit. thanks for the replies , these are the only pics the seller has sent me . We were supposed to meet up today but we just got blasted with a so called snow storm and he hasnt responded back to me so today doesnt look so promising now because I doubt hes going to want to drive a distance in this weather for $125 lol. Ive been looking up and down the WWW at differnt FG models but have yet to see one like this unless its a very older model like 2002 give or take a year. I swore id never buy 2wd rcs again but for the price I figured what the hell plus I drive a AMG as a daily driver so when I see benz rc stuff I get all mushy . Hopefully this guy gets back to me so I can really take a look at it . 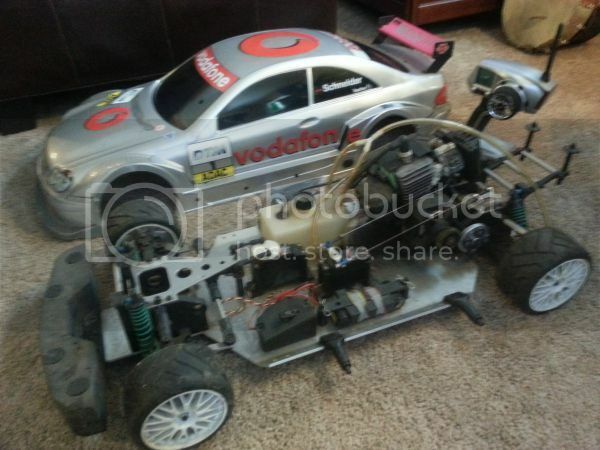 Its definitely a 1/5 or 1/6 scale gasser and for the price its an excellent deal. I'm not an expert on them, but it looks like an older FG, Harm, or maybe a Carson which is a clone but better than the chinese clones. I see the missing gear, that shouldn't be hard to find online. It looks like it does have a "can" type exhaust, but is missing the pipe that runs to the back. How are you guys saying this is a good deal when you don't know what kind of car it is? If it's a no-name one off parts will be difficult if not impossible to find. If it's a clone of a popular model it will be a money pit as everything (including the engine) will break quickly and need to be replaced. Now, as something to re-sell it seems like a good buy regardless. The body will easily get $100+, as will the remote and the wheels/tires. So that's at least $300 resale value, if you want to resell. But FloJo is talking about buying it to use as a driver. Without positive identification of the make/model I feel saying it is a bargain is a little bit short sighted. 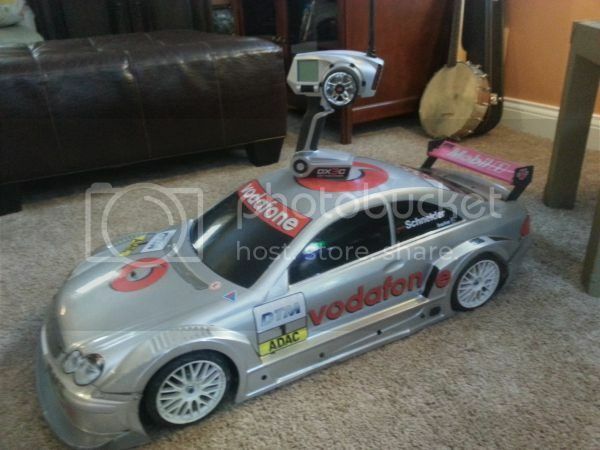 I searched all over the WWW myself and looked at numerous 2wd 1/5 scale cars and have not been able to find this car. In fact the car FloJo pictured has a very minimal and "cheap" looking front top plate as compared to every other car I saw. My conclusion- it's easily "worth" the asking price in parts alone, but as a driver or worthwhile candidate as a keeper we cannot accurately recommend without knowing more about the car. Get the guy to send more pics! thanks paralyzed , Ive contacted him askin for more pics but to no avail , maybe hes working , dont want to blow up his phone and sound all desperate for it lol . As soon as we come into contact ill def ask him to send some more pics of it . Really dont want a knockoff but Ill maybe still buy it even if it is and see if I can convert it to electric if gas doesnt work out . Take a chill pill Harold. He already stated that his intentions are to change it to brushless, so the motor is really not an issue, right? Even if he has to retrofit parts to make it a really good driving vehicle the fact that he is starting out at $125 is no big deal. The radio alone is worth that. Unless he is clueless about how to make an R/C run he should be in good shape. Parting that thing out would easily return his money, don't you think? I've just seen some really cheap knock offs that weren't worth the pot metal they were cast out of. And if parts aren't available it's a colossal waste of time. Break an unavailable part and it's worthless. Hopefully we get more pics, I want to know what the thing is now. It's probably the deal of the century and I'm being over skeptical.